A week after my birthday and I was still celebrating. Don't you wish we could celebrate for the whole month? 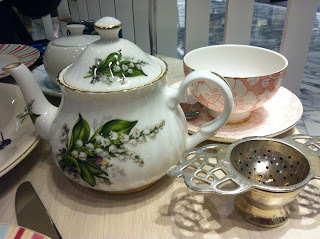 This time it was with my dearest friend C who took me out to a hi-tea event at The Victoria Room Tea Salon at Westfield Sydney. The tea room is located strategically in the centre of the Designer Gallery on Level 4. 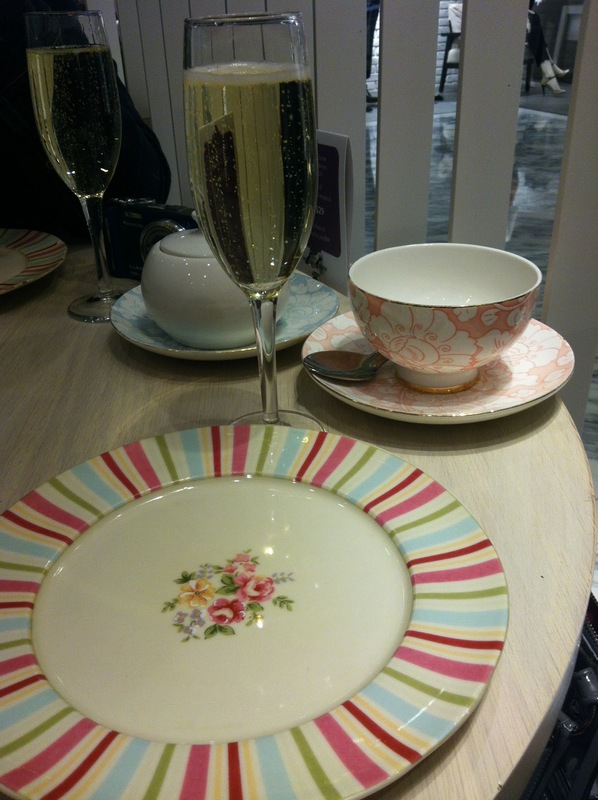 As one sips tea from lovely fine bone china tea cups with the little pinky pointing upwards (I didn't do this), you can also window shop at the same time, admiring the beautiful fashion in spring colours. The hi-tea event was part of the Crave Sydney International Food Festival, but you can also just visit at other times for hi-tea. There were many groups of ladies having hi-tea; it's such a girlie event, catching up on gossip, sipping tea or champagne (aka sparkling wine), tasting delicious morsels as we go. 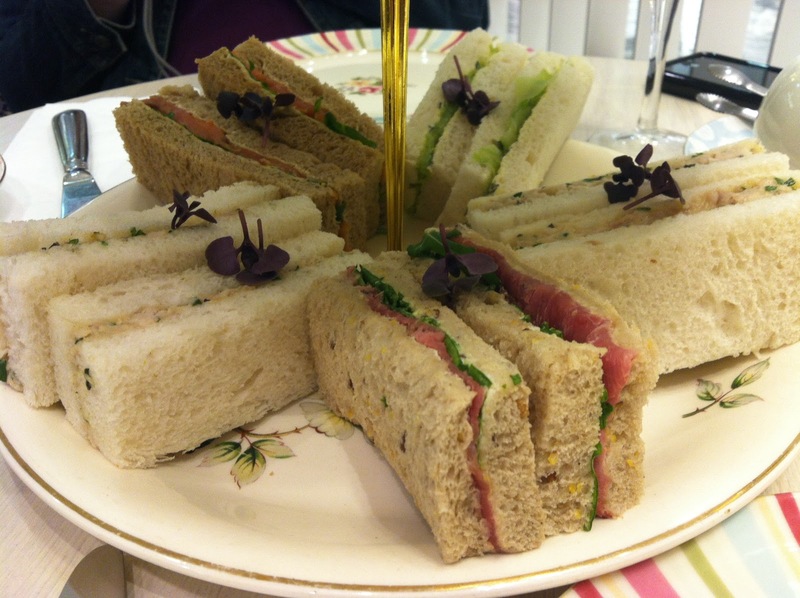 The typical English High tea usually involves a cup (mug) of tea, bread, cheese, vegetables and some meat too. I did a search on the web to find out more about high tea. 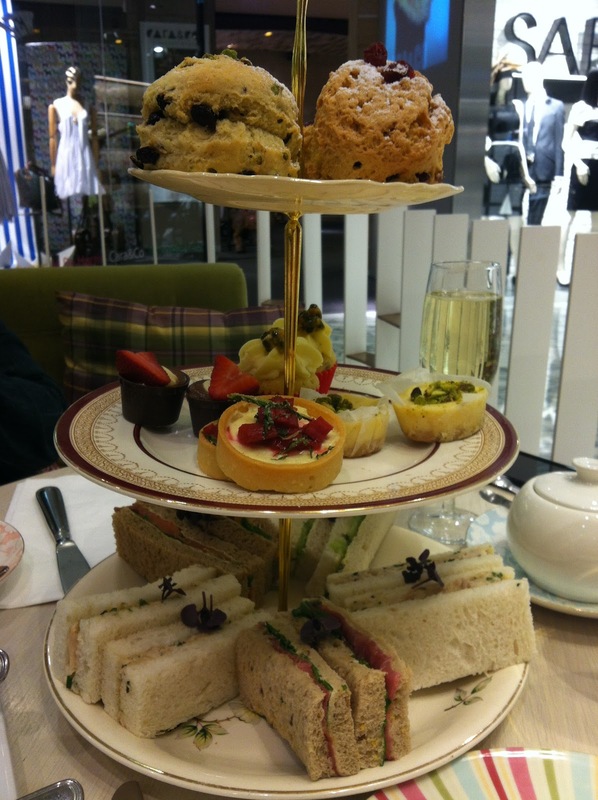 One possible reason I found states that "this type of meal was called high tea is the fact that it was eaten at a table", whereas afternoon tea is more casual and taken on sofas and comfortable chairs. That afternoon, C and I did not have a cup of tea, bread, cheese, vegetables and meat. Instead, we started out with a glass of sparkling wine, followed by crustless finger sandwiches with four different fillings - roast beef with horseradish and baby cress; smoked salmon with rocket, lemon and capers; cucumber with cream cheese and chicken with wild herbs. 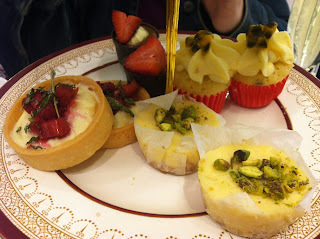 The next tier had the sweets - lemon cheesecake, chocolate mousse cup, vanilla cupcake with passionfruit icing and fruit tartlet. 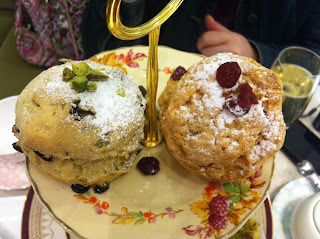 On the top tier were the two scones which we had each selected - C chose the white choc and cranberry and I chose the lemon, pistachio and currant. To accompany the delicious food, I chose an Assam tea; a strong full-bodied tea that goes well with milk. C chose a fruity herbal tea called Turkish Apple; beautifully sweet and tangy. I am truly blessed to have a friend like C. We've known each other for a number of years now, and we have been through some good and bad times too, as our friendship has grown. She was with me earlier this year when I had a breast cancer scare which turned out to be nothing. 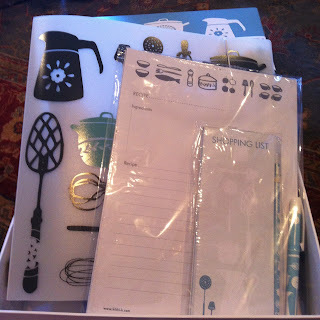 Besides the amazing hi-tea, C also gave me a Kikki-K Foodie Gift Pack - how perfect! Thank you C for the hi-tea and gift. P.S. Apologies for the photo quality. I brought my camera but only discovered the battery was flat at the Tea Salon.